This fun Bible quiz book for kids aged 6-10 provides 20 great multiple-choice quizzes to test your knowledge from Adam to Zacchaeus! There are hints and trivia for each question. About "My Final Answer For Kids"
Why should grownups have all the fun? Here's a version of the best-selling Bible trivia book that puts your kids in the hot seat! You'll find 30 sets of increasingly difficult multiple-choice questions based on Bible stories youngsters have heard in Sunday school. "Fun facts" add to the challenge. Why should the grown-ups have all the fun? 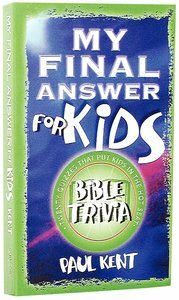 Now kids have their own version of My Final Answer, Barbour's Bible trivia book that sold 200,000 copies in its first year. My Final Answer for Kids follows the same multiple-choice format, but questions are geared for younger readers-all based on great Bible stories they've heard in Sunday school. "Bible Bonus" helps let readers "Double Your Chances" and "Look in the Book." The answer key offers fun "Did You Know?" trivia. Great stuff for kids ages six to ten. Paul Kent is the pseudonym of Barbour Publishing's senior non-fiction editor, Paul Muckley. He lives in eastern Ohio with his wife and two children.